After an extended period of relative calm in markets, February’s volatility served as a good reminder that investment risk has not disappeared. Although sudden market movements can cause anxiety, particularly for those with a short-term view, negative periods need to be put in perspective. This can be achieved by refocusing on the underlying longer-term investment objective. 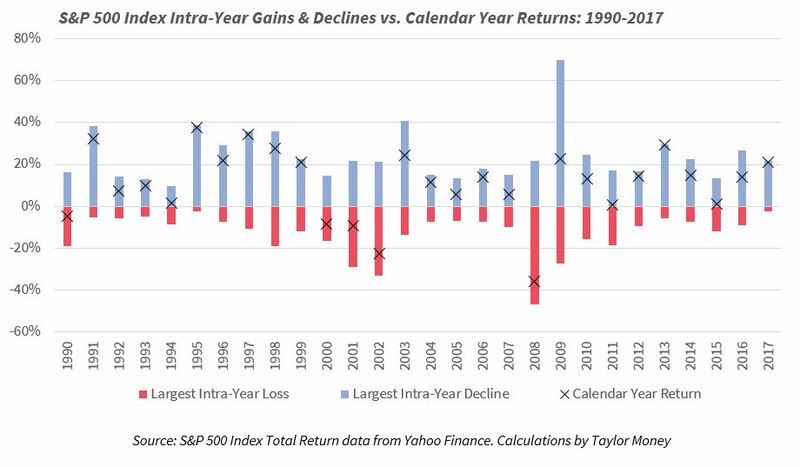 Consider the chart below which shows the calendar year returns (X) for the S&P 500 Index (US Equities) since 1990, as well as the largest intra-year decline and largest intra-year gain. Recently the S&P 500 Index fell just over 10% in the space of 10 days causing investors to panic and the press to call the end of the bull market. Using the historical data above we can put this kind of event into perspective. Since 1990, in nearly half of the previous 28 years, the S&P 500 index has experienced an intra-year decline of over 10%. More interestingly though, 23 of the years (over 80%) since 1990 have gone on to post a positive return for the year. This suggests that, although at times you may experience considerable losses, by remaining invested the odds of a positive return within a reasonable time frame are still in your favour. Interestingly, even when an investor is fully aware of the information above, many will still be tempted to try to time the market by attempting to avoid the negative periods such as 2000-2002. However, the fact remains that the price of an investment is the aggregate of market participants’ expectations and all available information. Therefore, to successfully time your investment you must be in possession of material information which will come to fruition and which will result in the market forming the same view as you. Of course, this is nearly impossible, and most successful market timing is likely a product of luck rather than skill. Not only is it difficult, but attempting to time the market can also can lead to serious consequences for an investor’s long-term returns. Historical data shows us that a large proportion of long-term returns are attributed to just a handful of days. If an investor incorrectly times the market and ends up missing out on one or more of these crucial trading days, it can severely reduce their long-term investment performance. Using the S&P 500 Index once more, the chart below demonstrates in practice our comments above. 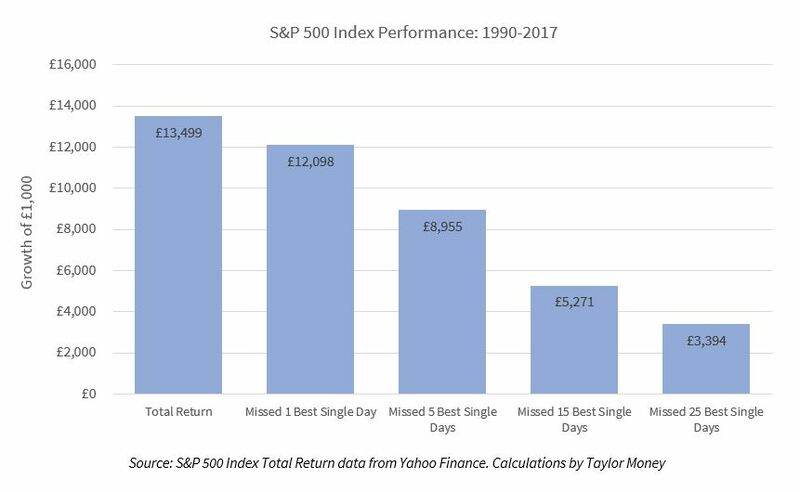 By missing just the single best day return between 1990 and 2017 the final value of an investment of £1,000 would be c. £12,100 rather than c. £13,500. That’s a difference of more than the original investment for just one day out of the market! Miss more of these days and the impact on the final value increases dramatically. Hopefully, these observations highlight that though periods of volatility can feel painful in the short term, making rash decisions during these can hurt even more over the long-term.